Side A = Mx. C6010-A was recorded on July 8, 1930 in Chicago, IL. Side B = Mx. C5866-A was recorded on June 24, 1930 in Chicago, IL. 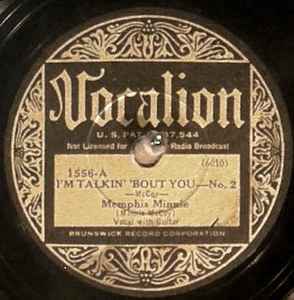 Originally released with track orders reversed on January 1, 1931 on labels bearing white panels that credit The Brunswick-Balke-Collender Company and lack the phrase "Not Licensed for Radio Broadcast" and matrices. This release, with labels bearing gold panels, dates to ca. 1932-35.